Under the Whole Plot tab (Figure 4.21) you can define default Zoning constraints and Building Parameters that are applied throughout the development area if not specified otherwise. To understand how Parameters work inside Modelur, please visit Parameters hierarchy explanation. Figure 4.21 - Whole Plot tab, which shows the default Parameters for the whole development area. If the Parameter in City Block or Building is not overloaded, the values defined here will be used. 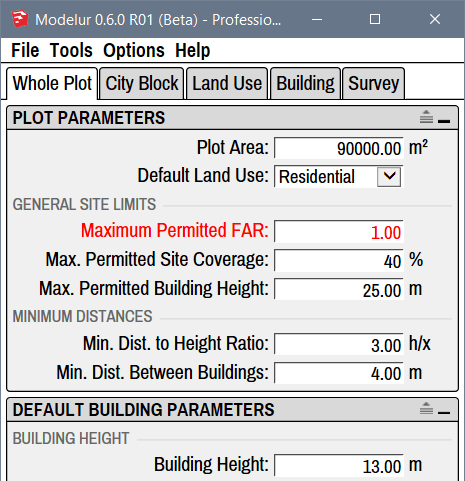 Inside the Plot Parameters panel you can define default parameters that are valid for the whole development area unless they are overloaded by specific City Blocks. Plot area represents the size of the whole development area. This parameter is used to calculate Floor Area Ratio (FAR = Gross Floor Area/Plot Area) and Site Coverage (Built-up Area/Plot Area) of the whole development area. In case you have any City Blocks defined, Modelur will automatically sum up their areas and display it here (and also use it in calculations). However, if you want you can overload sum of City Block's areas by simply entering the area size of your choice. If you then prefer to use calculated value instead, just delete your specified area size and Modelur will set it back to sum of City Blocks. Using default Land Use dropdown menu you can set the default Land Use for City Blocks and Buildings. 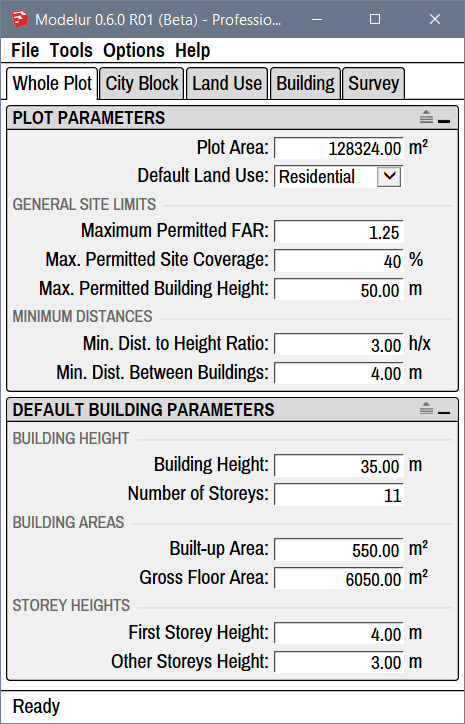 Land Uses are used to calculate Building's units (eg. apartments, residents, offices, etc), parking requirements, green area requirements, etc. To learn more about these settings, please visit Land Use section of this page. Under General Site Limits you can set the default constraints set by zoning ordinance so that Modelur can warn you if they are exceeded. But it will not prevent you from exceeding them. In case your development model exceeds set Zoning Constraints, they will become red, to warn you about it (Figure 4.22). Once the model is fixed to meet constraints again (or when zoning ordinance constraints themselves are updated), exceeded parameters will turn back to black. These parameters can also be set for each City Block separately. When defined on City Block level, they are valid only for that City Block (including the Buildings Heights). Figure 4.22 - When text color in Modelur user interface turns red, the Parameters in question are exceeded. Using maximum permitted Floor Area Ratio you can define allowable FAR for the whole development area. In case FAR value for the Whole Plot is exceeded, this line will become red, to warn you about it. If you don't want Modelur to validate achieved FAR, simply erase this value and hit Enter. Using maximum permitted Site Coverage you can define allowable Site Coverage for the whole development area. In case Site Coverage value for the Whole Plot is exceeded, this line will become red, to warn you about it. If you don't want Modelur to validate achieved Site Coverage, simply erase this value and hit Enter. Using maximum permitted Building Height you can define height restrictions for the whole development area. In case some Building is higher than specified here, this line will become red, to warn you about it. If you don't want Modelur to validate Buildings Heights, simply erase this and hit Enter. Minimum distance between Buildings is the absolute distance (in meters or feet) between any two Buildings. If the Buildings are placed closer than this specified distance, they will be marked red (assuming that Too low distance between Buildings is active). Default Building Parameters inside the Whole Plot tab are the topmost Building parameters in Modelur's hierarchy. This means that if the parameter in question is not defined by the Building itself (or any object in it's hierarchy, eg. City Block), Modelur will apply the values defined here to the Building. For example, when you create a new Building, it will contain number of storeys, Land Use, etc as defined here. Built-up area sets the default floor area size of the Building. Please note that this value will be automatically overloaded when creating the Building (to keep drawn floor area size) unless you check the Manually drawn floor plan assumes default Built-up Area under Building tab → Editing Modes of Building. Built-up Area will automatically be adapted if you change Gross Floor Area (described below) to match the division of Gross Floor Area with Number of Storeys. Gross floor area parameter is used to define default gross floor area size of the Building. If Building is created from scratch (no horizontal SketchUp Face is selected), this will be used to determine size of the Building (in combination with Number of Storeys). First storey height is used to set the default height of Building's ground floor. Changing this parameter will change default Building Height, too. Other storeys height is used to set the default height of all Building's storeys above ground floor. Changing this parameter will change default Building Height, too.